The 2017 NRHA Derby today welcomed the first go, first section of the $181,000-added Non Pro division of the Derby. With 227 horse-rider combinations entered, 110 made their way in the Jim Norick arena today vying for a spot in the finals. Topping the Level (L)4, L3 and Prime Time divisions with a 218 score was David McBurney and his Fancy Steppin Whiz (RC Fancy Step x TC West Coast Wendy). The 5-year-old stallion, ridden prevalently by his owner, boasts over $40,000 LTE. Stephanie Gripp rode her 5-year-old mare, Gunners Glory (Gunner x Dunit For Chex), to a 216 to lead the L2, L1 and Youth division. In the Masters Non Pro, Michael Garnett guided his own Snoop Around (Walla Walla Whiz x Sneaking Out Tonight) to the lead after posting a 216. The second section of the qualifier will open the day on Tuesday at 8 am. 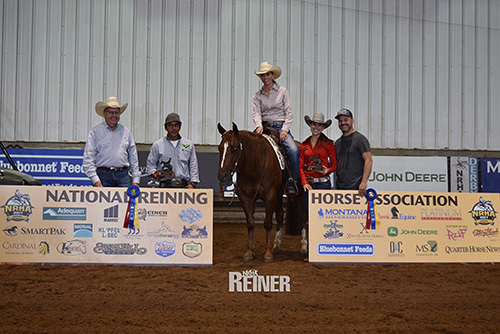 NRHA Professional Shauna Larcombe, an Australian native based in Pilot Point, Texas took first place honors in the $3000-added NRHA Intermediate Open class. “We wanted to put him in a class before Jessica (Sternberg) shows him later in the week. 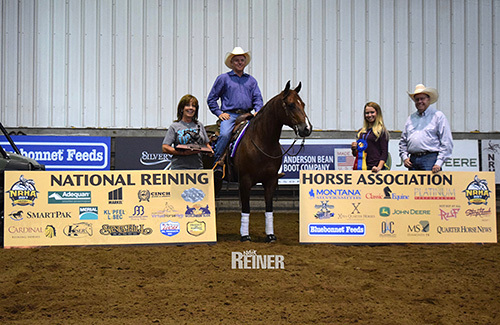 He’s a great horse many people would know and it’s truly a pleasure to ride him,” said Larcombe about the 12-year-old gelding that boasts over $285,635 NRHA LTE and who is owned by NRHA Million Dollar Owner and Hall of Famer Rosanne Sternberg. Larcombe also took reserve honors with Spook N Sparkle (Smart Spook x Setting Off Sparks), also owned by Rosanne Sternberg, between the reins. Ashley Stroh of Gainesville, Texas won both the $500-added NRHA Limited Open and the $500-added Rookie Professional in Monday’s ancillary action aboard Jerrys Mizzen Money (Jerry Lees Surprise x Miss Moth Money). 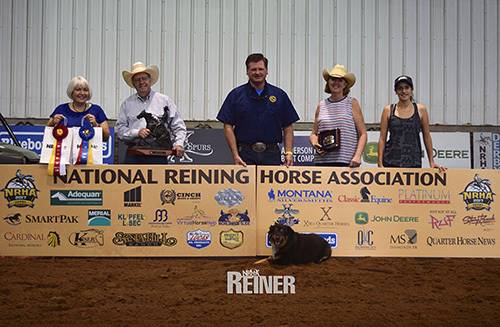 “He was great, this is one of the first times I’ve tried to show him, he stayed with me 100% all the way and I’m excited to continue showing him,” said the NRHA Professional about the 2008 gelding she owns. Riding Chics Love Me Wiimpy (Wimpys Little Step x Dream About Magic), a 2010 gelding owned by DAG Ventures LLC, Josh Tishman took second place in both classes. Greg Hall and Chics Mainattraction (Conquistador Whiz x Chictastic) a 7-year-old mare owned by Mary Anne Hall, Gainesville, Texas marked a 144 to win the $1,000-added NRHA Novice Horse Non Pro Level 2. The farrier of Gainesville, Texas, says the mare has continued to overcome obstacles and succeed not only in the show pen but also as a producer. 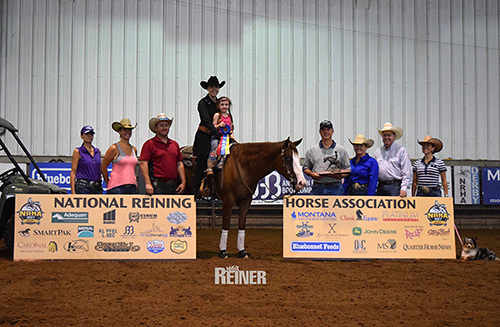 Her talent shone with NRHA Million Dollar Rider Jason Vanlandingham and she continues to win for the Hall family. Melissa Wigen and her 2007 gelding Dunit In Wranglers (Starlights Wrangler x A Bueno Poco Dunit) scored a 143 to place second. In the $1,000-added NRHA Novice Horse Non-Pro Level 1, Auburn University animal science junior Blair McFarlin rode Lil Jac N Gin (Lil Gun x Peppys Lightning Jac) to victory with a 142. McFarlin’s school schedule keeps her from showing as much as she’d like but she is thankful for the opportunity to ride her father’s (Mike McFarlin) 5-year-old mare during the summers when she is home in Franklin, Tennessee. Cheryl Lauder of Weatherford, Oklahoma, guided Who Whiz Smartin Off (Who Wiz It x Little Smart Jac) to the reserve title 140 score.